Prepare to a special presentations? The Doosl Latest Metal Green Laser Pointer IT032 is ready for you. The brilliant green laser light is stronge enough to be seen clearly, Focus their full attention on your most important points, chart, map location or technical diagram etc. With aluminum alloy metal body, which give your a special confortable and smoothly feel in hand. You can move around freely and engage your audience with reliable wireless range of up to 330 feet.Whether you're doing PPT presentation in the classroom, or in the business conference, or Training center etc, No waiting. No hassles. No software to install, just plug,play and go. 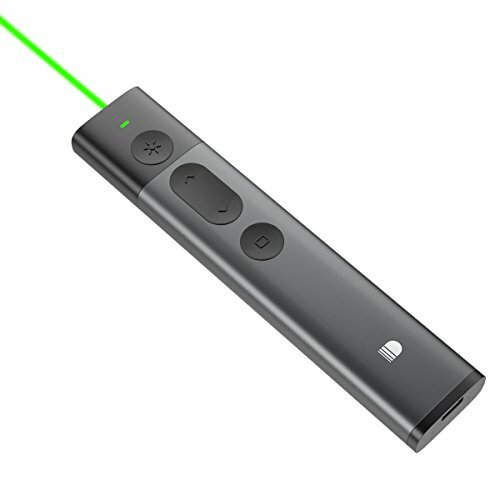 Enjoy your presentations anytime with Doosl Laser Pointer. Multifunctional Presentation Remote -Operating on 2.4G RF frequency. Support Page Up, Page Down,Full Screen, Black Screen, Press and hold the Page Up button for full screen or exit. Press and hold the Page Down button for black screen or exit. Support Enter,Tab,Alt-tab and hyperlinks. Plug-and-play wireless USB receiver - USB wireless receiver stores inside the presenter for easy pack up and portability, No waiting. No hassles. No software to install. Just plug,play and go.Operation system: Windows 2003, XP, Windows Vista, Windows 7, Windows 8,Windows 10,Mac OS, Linux.